Present your final, independent project, Tuesday, May 8, 12-2 in the Fine Arts conference room. Have your project ready for review at noon – projection, installation, etc. Please remove your proposal and replace with final project title, link (media or web), and project description. Make sure projects 1, 2, and 3 are in their folders. Bring drinks, cups, and sweets—I’ll order pizza. If you didn’t know, there are system and design fonts available to you. The system fonts are always available, the design fonts have to be accessed through the Universal Type Client. Follow instructions on the PennDesign IT site, here. Apparently Yale University is organizing a TEDx event on the Art and Science of Happiness. It’s actually happening on the 28th (so real soon!). We briefly mentioned the Felton Report in class, but never went over it at length. Specifically, the 2010/2011 report has an excellent color scheme, typeface selection, and beautiful representations of day-to-day minutiae. 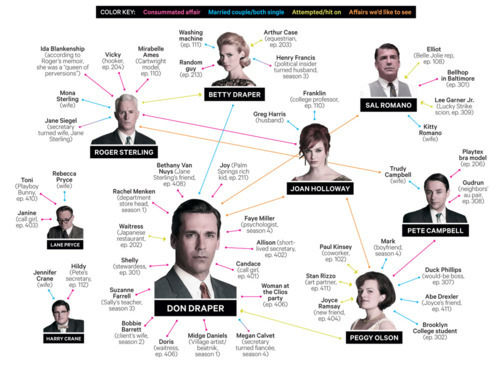 Also, who doesn’t appreciate a good infographic diagramming love triangles, so here are a couple from Gossip Girl [Vulture] and Mad Men [Brentt Consulting]. “Percentage of World GDP” – charts GDP of different nations over (a long) period of world history based on estimates.